NASA WALLOPS FLIGHT FACILITY, VA – Investigators probing last week’s catastrophic failure of an Antares commercial rocket moments after liftoff, are pointing the finger at the rocket’s Soviet-era built engines as the probable cause of the huge explosion that destroyed the booster and its NASA payload in a raging fireball after liftoff from NASA’s Wallops Flight Facility, VA, according to Orbital Sciences managers. 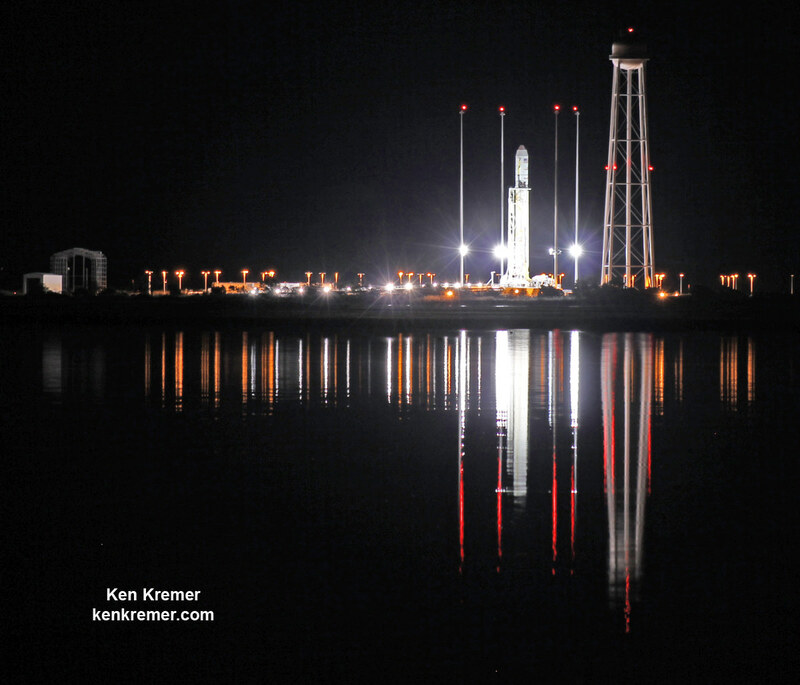 The Orbital Sciences privately developed Antares rocket was doomed by a sudden mid-air explosion some 15 seconds after liftoff from NASA’s Wallops Flight Facility, VA, at 6:22 p.m. EDT on Tuesday, October 28. Antares’ first stage is powered by a pair of refurbished Aerojet Rocketdyne AJ26 engines originally manufactured some 40 years ago in the then Soviet Union and originally designated as the NK-33. Overall this was the 5th Antares launch using the AJ26 engines. See my exclusive photos above and below showing the AJ26 engines with their original NK-33 stencil, during prelaunch processing and mating to the first stage inside Orbital’s Horizontal Integration Facility (HIF) at NASA Wallops. The NK-33 was originally designed and manufactured in the 1960s by the Kuznetsov Design Bureau for the Soviet Union’s planned N1 rocket to propel cosmonauts to the moon during the space race with NASA’s hugely successful Apollo Moon Landing program. Engineers assisting Orbital’s Accident Investigation Board (AIB) say that failure in the AJ26 turbopump is the likely cause. The AIB is chaired by David Steffy, Chief Engineer of Orbital’s Advanced Programs Group. “While the work of the AIB continues, preliminary evidence and analysis conducted to date points to a probable turbopump-related failure in one of the two Aerojet Rocketdyne AJ26 stage one main engines,” Orbital said in a statement. “As a result, the use of these engines for the Antares vehicle likely will be discontinued,” said Orbital. “We will likely discontinue the use of AJ26 rocket engines that had been used on the first five Antares launch vehicles unless and until those engines can be conclusively shown to be flight worthy,” noted David Thompson, Orbital’s Chairman and Chief Executive Officer, during an investor conference call. Orbital’s options for the way forward will be outlined in a separate story. The Oct. 28 launch disaster was just the latest in a string of serious problems with the AJ-26/NK-33 engines. Earlier this year an AJ26 engine failed and exploded during pre launch acceptance testing on a test stand on May 22, 2014, at NASA’s Stennis Space Center in Mississippi. Besides completely destroying the AJ26 engine, the explosion during engine testing also severely damaged the Stennis test stand. It has taken months of hard work to rebuild and restore the test stand and place it back into service. An extensive engine analysis, recheck and test stand firings by Aerojet Rocketdyne and Orbital Sciences engineers was conducted to clear this new pair of engines for flight. Aerojet Rocketdyne purchased approximately 40 NK-33 engines in the mid-1990s and ‘Americanized’ them with multiple modifications including a gimbal steering mechanism. AJ26 engine failure was immediately suspected, though by no means certain, based on an inspection of numerous photos and videos from myself and many others that clearly showed a violent explosion emanating from the base of the two stage rocket. The remainder of the first stage and Antares entire upper stage was clearly intact at the moment of the explosion in all the imagery. Antares was carrying the unmanned Cygnus cargo freighter on a mission dubbed Orb-3 to resupply the six person crew living aboard the International Space Station (ISS) with science experiments and needed equipment. The AIB is making rapid progress in assessing the accident’s cause based on an analysis of the rocket’s telemetry as well as the substantial amounts of debris collected from the rocket and the Cygnus cargo freighter at the Wallops launch site. A preliminary review of telemetry and video data has been conducted and substantial debris from the Antares rocket and its Cygnus payload has been collected and examined. The 14 story Antares rocket is a two stage vehicle. The liquid fueled first stage is filled with about 550,000 pounds (250,000 kg) of Liquid Oxygen and Refined Petroleum (LOX/RP) and powered by a pair of AJ26 engines that generate a combined 734,000 pounds (3,265kN) of sea level thrust. The doomed mission was bound for the International Space Station (ISS) on a flight to bring up some 5000 pounds of (2200 kg) of science experiments, research instruments, crew provisions, spare parts, spacewalk and computer equipment and gear on a critical resupply mission in the Cygnus resupply ship. The Orbital-3, or Orb-3, mission was to be the third of eight cargo resupply missions to the ISS through 2016 under the NASA Commercial Resupply Services (CRS) contract award valued at $1.9 Billion. Orbital Sciences is under contract to deliver 20,000 kilograms of research experiments, crew provisions, spare parts, and hardware for the eight ISS flights. I was an eyewitness to the awful devastation suffered by the Orb-3 mission from the press viewing site at NASA Wallops located at a distance of about 1.8 miles away from the launch complex. I was interviewed by NBC News and you can watch the entire story and see my Antares explosion photos featured at NBC Nightly News on Oct. 29 here. Watch the Antares launch disaster unfold into a raging inferno in this dramatic sequence of my photos shot on site here. Check out my raw video of the launch here. Read my first hand account here. Watch my interview at Universe Today’s Weekly Space Hangout on Oct 31, 2014, here.